Christopher Burton went into stadium jumping on Sunday with four rails in hand. And he needed every one of them! Very impressive of him to stay in the lead since dressage. It was hard to ride a clean round — probably a combination of horses tired from the hard cross country day and the wet footing. Course designer Richard Jeffery said they wheeled the course generously on Sunday morning to make the turns a bit less challenging, and they also added three seconds to the optimum time after the first few horses. Andrew Nicholson was second on Nereo, moving up a spot after Tim Price brought down three rails. 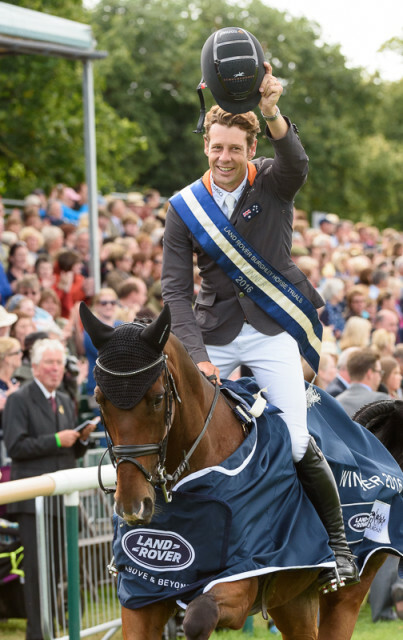 In an interview on Burghley TV, Nicholson talked about how he is still recovering from last year’s accident. “You don’t know how special this is,” he said. He certainly looked stiff as he finished his cross country ride. Watch the interview with Andrew Nicholson after XC. Third and fourth place went to Jonelle Price and Tim Price (is the first time a married couple finished in third and fourth?). And just because it’s hard to get enough of Burghley XC and show jumping, below is some helmet cam footage. I was pulling for Elisa Wallace and Johnny, but I’m happy for anyone who wins such an elite event. Actually, I’m thrilled that people and horses were safe. At least I think they were. I didn’t get to watch it, but I didn’t read any grisly stories from this event. There were a few falls but no one (rider or horse) was badly injured. It was a tough course made more challenging by the rain. Worth watching some of the XC on demand!